Detail of a manuscript in the Bodleian Library. 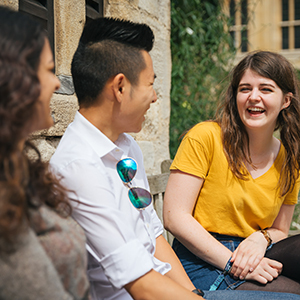 The English Language and Literature course at Oxford is one of the broadest in the country, giving you the chance to study writing in English from its origins in Anglo-Saxon England to the present. As well as British literature, you can study works written in English from other parts of the world, and some originally written in other languages, allowing you to think about literature in English in multilingual and global contexts across time. 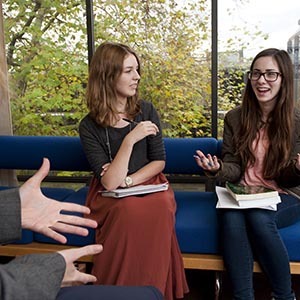 The course allows you a considerable degree of choice, both in developing your personal interests across core papers, and in choosing a topic for your dissertation and for a special option in your final year. Options have included Literature and revolution, Postcolonial literature, Writing lives, Old Norse, Tragedy, and Film criticism. 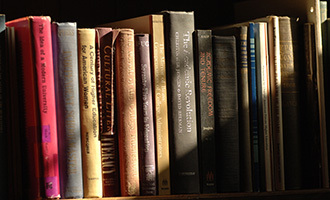 Studying literature at Oxford involves the development of sophisticated reading skills and of an ability to place literary texts in their wider intellectual and historical contexts. It also requires you to consider the critical processes by which you analyse and judge, to learn about literary form and technique, to evaluate various approaches to literary criticism and theory, and to study the development of the English language. The Oxford English Faculty is the largest English department in Britain. Students are taught in tutorials by an active scholar in their field, many of whom also give lectures to all students in the English Faculty. You will therefore have the opportunity to learn from a wide range of specialist teachers. Library provision for English at Oxford is exceptionally good. All students have access to the Bodleian Library (with its extensive manuscript collection), the English Faculty Library, their own college libraries and a wide range of electronic resources. In your first year you will be introduced to the conceptual and technical tools used in the study of language and literature, and to a wide range of different critical approaches. At the same time, you will be doing tutorial work on early medieval literature, Victorian literature, and literature from 1910 to the present. In your second and third years you will extend your study of English literary history in four more period papers ranging from late medieval literature to Romanticism. These papers are assessed by three-hour written examinations at the end of your third year. You will also produce a portfolio of three essays on Shakespeare, on topics of your choice; an extended essay (or occasionally an examination) relating to a special options paper, chosen from a list of around 25 courses; and an 8,000-word dissertation on a subject of your choice. Submitted work will constitute almost half of the final assessment for most students. Alternatively, in the second and third years, you can choose to follow our specialist course in Medieval Literature and Language, with papers covering literature in English from 650-1550 along with the history of the English language up to 1800, with a further paper either on Shakespeare or on manuscript and print culture. Students on this course also take a special options paper and submit a dissertation on a topic of their choice. Although details of practice vary from college to college, most students will have one or two tutorials (usually two students and a tutor) and one or two classes (in groups of around 8 to 10) each week. A tutorial usually involves discussion of an essay, which you will have produced based on your own reading and research that week. You will normally be expected to produce between eight and twelve pieces of written work each term. Most students will also attend several lectures each week. Tutorials are usually 2-3 students and a tutor. Class sizes may vary depending on the options you choose. In college, there would usually be 6-12 students and in the department there would usually be no more than 15 students. There might be specific circumstances in which some classes contained around 20 students. Most tutorials, classes, and lectures are delivered by staff who are tutors in their subject. Many are world-leading experts with years of experience in teaching and research. Some teaching may also be delivered by postgraduate students who are usually studying at doctorate level. Three written papers form the First University Examination, together with a submitted portfolio of two essays for Introduction to English language and literature. All exams must be passed, but marks do not count towards the final degree. More information on current options is available on the English Language and Literature website. All period papers will be examined by final written examinations at the end of the third year. 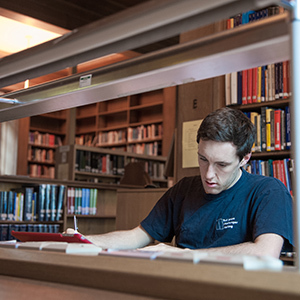 Most students will submit one extended essay for Special options, due in at the end of the first term; dissertation and portfolio for Shakespeare/The material text, due during the second term. Essential: Candidates are expected to have English Literature, or English Language and Literature to A-level, Advanced Higher, Higher Level in the IB or any other equivalent. Helpful: A language or History can be helpful to students in completing this course, although they are not required for admission. All candidates must take the English Literature Admissions Test (ELAT) as part of their application. Separate registration for these tests is required and it is the responsibility of the candidate to ensure that they are registered. We strongly recommend making arrangements in plenty of time before the deadline. For everything you need to know, including guidance on registration and preparation, can be found on the ELAT page. Description: Candidates are required to submit one recent example of writing. This should be a marked essay produced in the normal course of your school or college work and should not have been rewritten after marking. Preferably it should be an analytical discussion of a topic or topics in the field of English literature, though an English language topic is permissible. It should not be a short timed essay, a critical commentary on particular passages of text (practical criticism exercises), or a piece of creative writing. For general guidance and to download the cover sheet, please see our written work page. Successful candidates will give evidence of wide, engaged, and thoughtful reading. The ELAT and written work help us to gauge your analytical skills and your writing. Interviews allow us to explore your enthusiasm for literature, your response to new ideas and information and your capacity for independent thought. We are not looking for any particular reading, or particular answers: we are interested in your ideas and in how you engage with literature. Shortlisted candidates may also be asked to discuss an unseen piece of prose or verse given to you before or in the interview. Tutors appreciate that you may be nervous, and will try to put you at ease. For more detail on the selection criteria for this course, please see the English website. Our students go on to succeed in a very wide range of careers: the analytical and communication skills that develop during this course equip them for many different paths. Popular careers and fields include the law, advertising, acting, publishing, politics, teaching, librarianship, public relations, journalism, writing, further research, management consultancy and finance. Why not have a look at the University's collection of literary resources on our Great Writers Inspire site or the British Library's online resources? You may also like to listen to radio programs such as BBC Radio 4's In Our Time, or one of the University's podcast series. Alternatively magazines like The New Yorker, or journals like London Review of Books and The Paris Review, contain lots of fascinating long-read articles and essays.